Round two of the enduro was run last night and it looks as though the dry winter we are having is keeping the racers away. One after another is coming down with dreaded lurgys this winter but luckily we were blessed with the presence of the father of our group Viv or (COB) as he is known on the forum. It was great to meet Viv and I think he surprised himself with his performance as the night wore on actually picking up a third in the Ninco classics we ran after the enduro. Devious Dave should now be called Grumpy Dave. 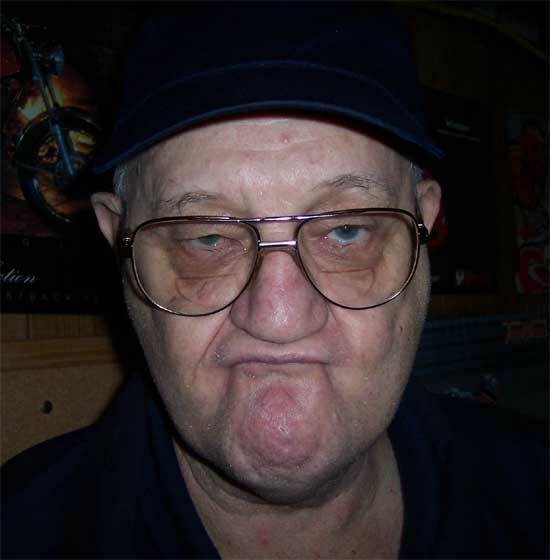 This is the big blokes race face so you know not to cross him on the track. Viv in the centre getting back in the groove with Al(Andy Capp) Collins and Joe(Schumacher). Start line for the enduro. All classes are Open so cars can be modded and as you will read a lot were. 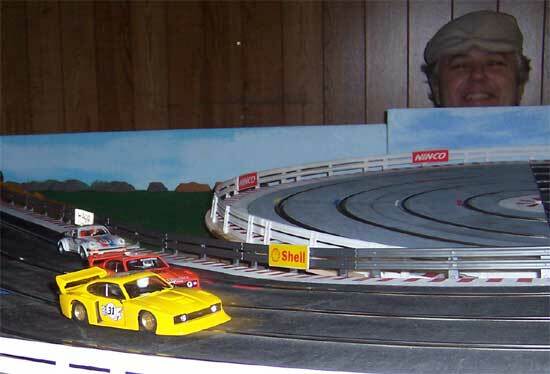 Angry Charlie ran the yellow Fly Capri in the Sport sedan class in the enduro with Daniel next to him in the Ninco Porsche in the Sports Car class. 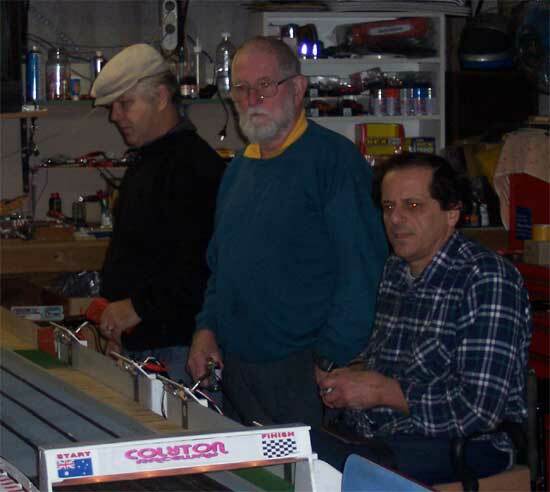 Joe had his SCX F40 with a Fly Racing Capri Chassis in the Sports Car class and Viv ran Daves Scalextric Jag with Slot it HRS chassis. Charlie and Viv running together at the hairpin. If you look closely you can see the magnetic suspension through the rear of Viv's loan car. Another heat and team Jagermiester run here with Bo Porsche and Dave Fly Racing Capri. 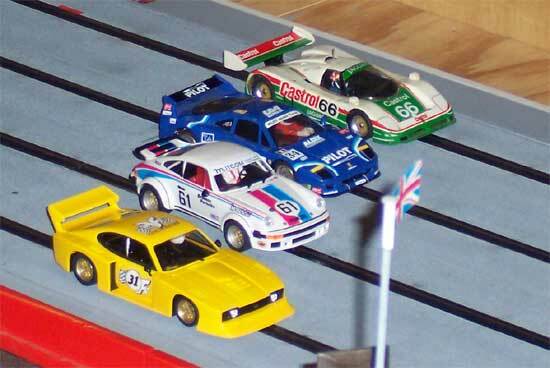 Al had his Fly racing Capri alongside with Joe in the F40 again. Bo's car was a missile with a MRRC Cobra red motor rated at 35000rpm in it. He needed the Professor adjustable controller to keep it under control. It shows well for the Ninco NC6 motor though as my Canon Porsche with 24 tooth crown was equal in a straight line and a touch stronger under brakes. Hats off to Bo though for trying such a hairy motor with a non magnet car. Dave hanging it all out through the hairpin with Joe entering it. Could that be the first official picture of Dicky Knees face? 1st Myself with Slot it 956 with NC6 engine. 2nd Bo with Slot it 956 with MRRC red motor. 3rd Viv with Scalex Jag Slot it chassis and Boxer motor. 1st Joe with SCX F40 with Fly Racing Capri running gear. This fitted straight in too. 2nd Daniel with Ninco 934 standard NC5. 3rd Chris with Scalex Camaro Fly engine. To finish the Enduro report here is Chris's Camaro after an altercation with a barrier. Those Camaro bumpers are vulnerable. Was a great night with all sorts of fun. 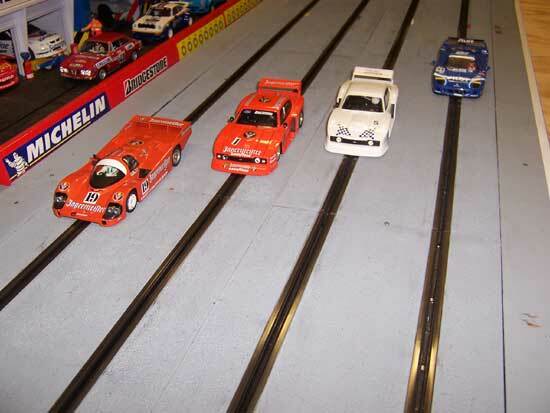 I took a new track record with my Porsche 956 at 6.40 seconds Charlie clocked his first 6 second lap with a 6.99 in the Capri. The meeting of the father of the group and Charlie also showing how to keep young fellas in order. Ended up a quiet night after that. I will post the Classics later as I am going riding now. 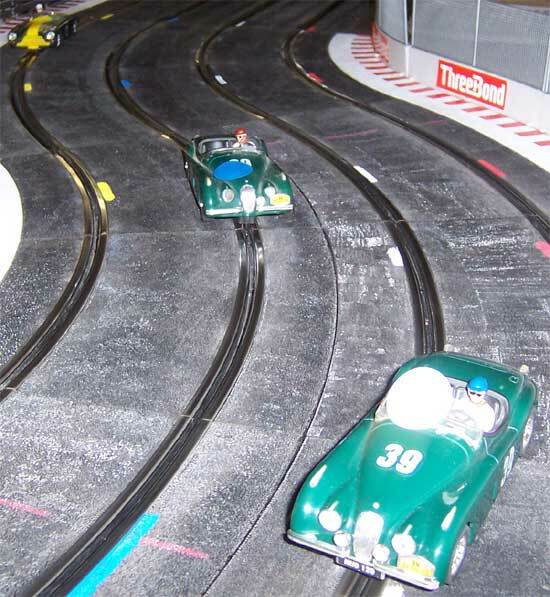 The NC1 Classics class provided a bit of light harted racing after running an Open Enduro for an hour each. 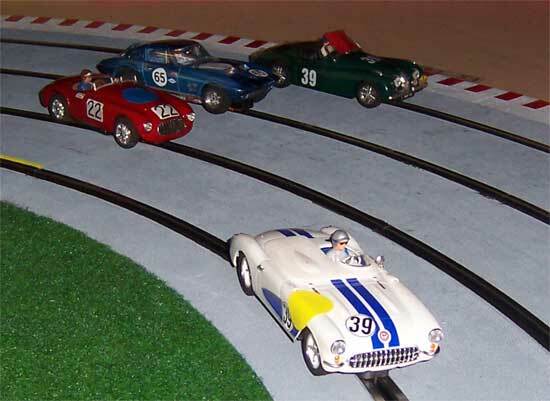 The class has changed from Ninco Classic to Pre 1966 cars with NC1 engines which has given us a chance to run Carrera's and Monogram cars. 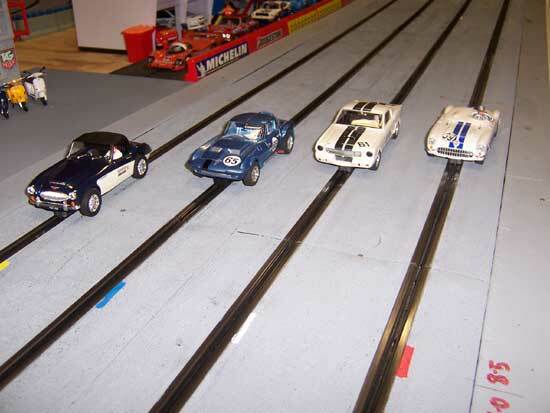 As you can see there is a wide range of cars now with Chris running the Ninco Healy, Big Al running the the Monogram Vette, myself running the Monogram GT350R and Bo running the Ninco Vette. Bo had the holeshot here but was rounded up by Joes Jag and Daves Ferrari to end up third this heat. 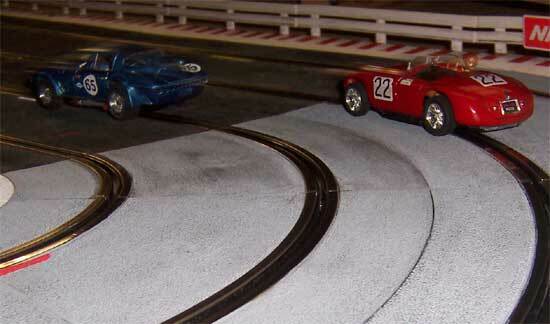 Those Ninco Cobra tyres don't always work too well on Ninco track as they can end up having too much grip. Dave and Big Al exiting the hairpin. 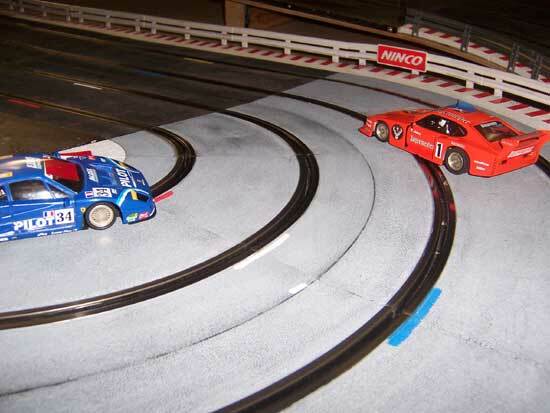 The Ninco 166 is turning out to be quite a good race car in the Classics class as Glenn proved last round. 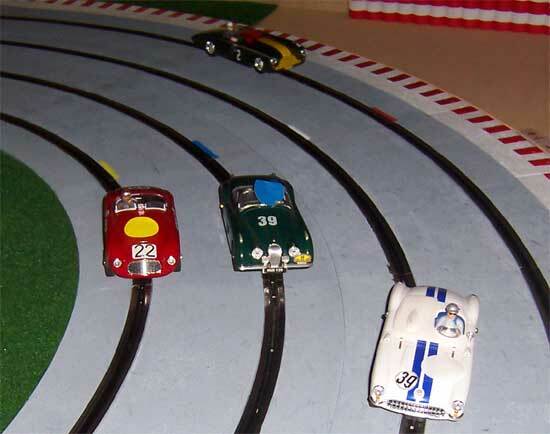 Charlie is the lone Carrera in this bunch of Ninco cars. Great photos of what looks like a top night. 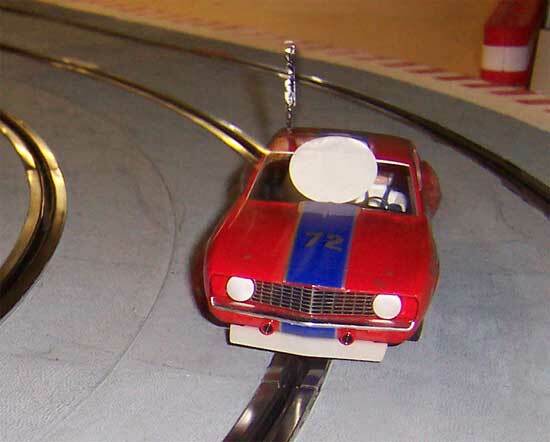 How did the Revell Mustang handle. I'm taking one to Geds' on Tuesday so I'd be interested to know. Also, Vince, why did you change the motor from your Slotit Porsche? Do you find the Nincos a better motor? Have you tried a Proslot Evo3? They snap straight in and are smooooth as. Just a thought. Thank you gentlemen for a most enjoyable night .great pics vinny , Just wish that I could join you more often But 600 k's each way is a bit much even for an old legend. Thanks Vinno great pics as always. It is good the see the classics race now with such a mixture of cars. It really adds to the night. The Ninco's might still be the cars to beat but having something different is just as enjoyable as winning. I must go as I noticed that next door has some lead left on his roof I must have missed last time. One good thing about having that green brick loaded with lead is that everyone gives way to you on the corners. If I go off I am bound to take anyone around me out as well. Bo might have to reinforce that table as I noticed that it was saging a little when my Aston came around. On a serious note it is great to see this Carrera hold its own out of the box it was such a dog and it has taken a lot of work to get it to the point where it can hold its own. I may have to upgrade the drum brakes as she is difficult to pull up down that main straight. Once you get all that lead in motion that motion just wants to keep on going. I have lowered the Mustang about 2mm to the top of the guards and done quite a few chassis mods to make it tilt. It ran better than I expected and was not too far off the pace of some faster cars. I also ran Ninco Classic tyres on the rear and shaved the front tyres as well as a Ninco sprung guide and the NC1 motor we use in this class. 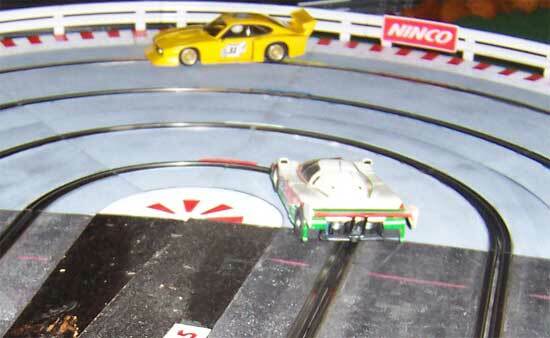 The Slot it Porsche with the NC6 is what I do to all my Slot it cars. The NC6 is more drivable than the V12 motor with more bottom end and also has a more linier feel to it. I run a 24 tooth crown with the 9 tooth pinion and still have much stronger braking than a V12 engined car. It has a similar top speed with this gearing combo and the extra low down weight of the long can motors helps weight distribution. It works as I now hold lap records on every lane at Colyton. They will fall of course. This is a similar motor combo to what is run in europe in the endurance races over there as the Ninco motors are very cool running when compared to the shorter motors like V12's and Pro Slot evo motors which heat up quite a bit. It was good to finally meet you. Hope you can come down again and give us a hard time on the track. Thanks for the explanation, Vinno. I may just give that a go.